Our spirits at Crown Prince Seafood are uplifted as we found a rewarding way to cash in on our recycled cans and bottles. We are sponsoring two children from Thailand, a country that we source many of our products, including Tuna, Crab Meat, and Clams. We are very excited to make a difference in the life of not one child, but TWO! Compassion International is a Christian child advocacy ministry that releases children from spiritual, economic, social and physical poverty and enables them to become responsible, fulfilled Christian adults. Today, Compassion helps more than 1.2 million children in 26 countries. Our sponsor child Arto Mayer is 9 years old and lives with his parents and 3 siblings in a hillside community in Thailand. 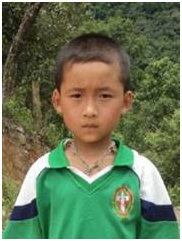 His favorite activities include soccer and singing, and he also regularly attends church activities. He is responsible for carrying water, washing clothes, and helping in the kitchen. Ban Pa Pao is located in Northern Thailand and is home to approximately 3,300 residents. Typical houses are constructed of bamboo and have thatched roofs. The regional diet consists of maize, beans, bananas, chicken, fish and rice. Common health problems in this area include malnutrition, colds and tooth decay. Most adults in Ban Pa Pao work as day laborers and earn the equivalent of $33 per month. This community needs schools, Thai language teachers and improved roads. 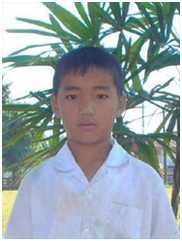 Our sponsor child Nattawat Kingkornkan is 9 years old and lives with his parents and 2 siblings in a small mountainous community in Thailand. His favorite activities include singing and telling stories, and he also regularly attends church activities. He is responsible for making beds. Baan Jamnoi is located in Northern Thailand and is home to approximately 500 residents. Typical houses are constructed of wood with corrugated iron roofs. The regional diet consists of maize, rice, pork, bananas and vegetables. Common health problems in this area include skin diseases and conjunctivitis. Half of the adults in Baan Jamnoi are unemployed, but some work in agriculture and earn the equivalent of $17 per month. This community needs tuition assistance and stable employment opportunities. Through Compassion International, our sponsorship provides Arto and Wat with opportunities to help them break the cycle of poverty. Compassion child development centers promote healthy development including eating nutritious meals, learning the proper way to brush their teeth, regular health checkups, getting help with their homework, language tutoring, Bible studies, playing soccer and community service opportunities. Arto and Wat now have a safe place to learn, grow, play and dream about a future free from poverty. Visit www.compassion.com to find out how you can make a difference in the life of a child. ← Think Outside the Box and Make Lunchtime Healthy and Fun!